The Victorian era saw great advances in the production of books, which on the one hand made books more widely available, and on the other made the production of high quality books possible. The library holds an interesting selection of Victorian illustrated books in its special collections. When Queen Victoria came to the throne in 1837, book illustrations were mostly created using wood block and copper plate. Hand finished colour printing arrived in the 1840s. By 1890 photographic processes such as photolithography and photogravure had replaced block printing. Decorative bindings were also popular. The Victorians published a great many books on natural history, and there are several splendid illustrated books on flowers, birds, butterflies and sea life in our collection. The image selected for this blogpost is taken from Mary and Elizabeth Kirby’s Beautiful birds in far-off lands which was published in 1873. It shows the ‘Resplendent Trogon and Ceylonese Sun Bird’, an image which is the most viewed item on our flickr pages, which contain thousands of images from our archives and special collections. 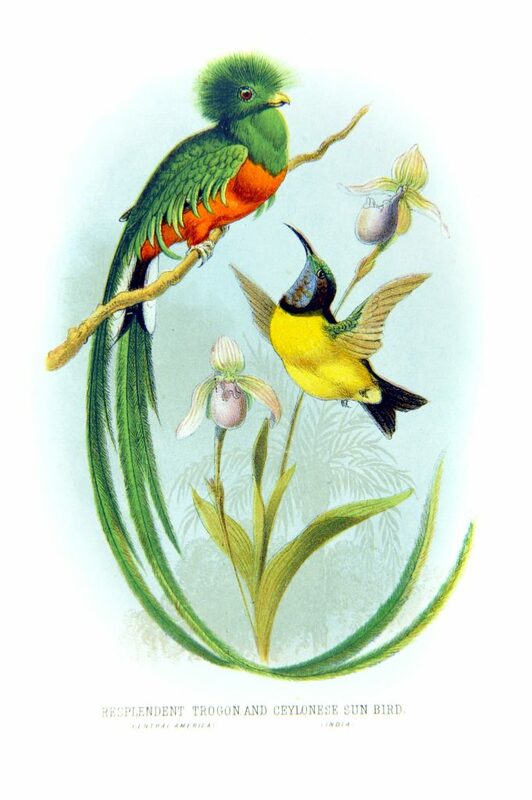 Resplendent Trogon and Ceylonese Sun Bird, from Beautiful birds in far-off lands, Mary & Elizabeth Kirby, 1873.